Thanksgiving can be hard to enjoy or plan when you're on a busy schedule. 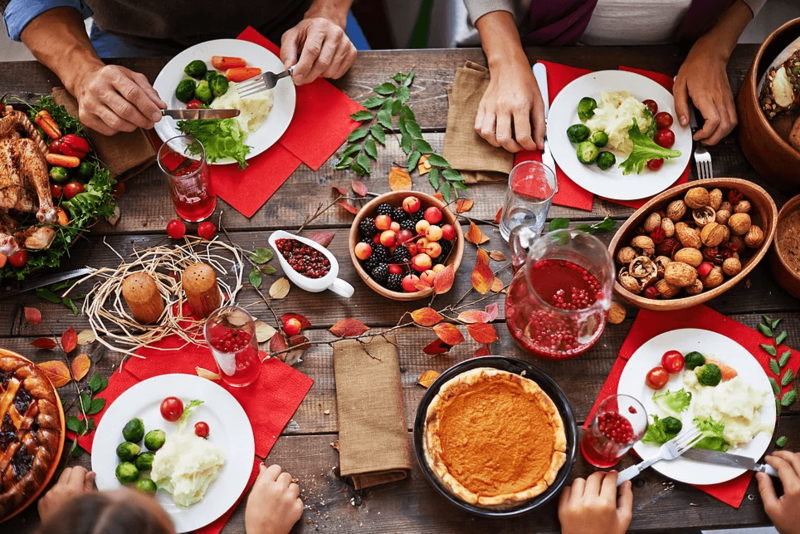 Thankfully, these New York restaurants have you covered when it comes to enjoying your Thanksgiving feast on a tight schedule. Kellari (19 W 44th Street) is offering a three course prix fix menu for $80 a person on Thanksgiving day beginning at 11:30am. Enjoy your choice of appetizers which include Butternut Squash and Sweet Potato Soup, Veal Strips, Pan Seared Scallops, Lobster Dome and a Salad Athinaiki made with a steamed wild fish, green apple and sea beans. Entrees include your choice of Organic Turkey from Koch's Turkey Farm in PA served with greens, toasted almonds, vine leaves stuffed with bulgur, pistachios, chestnut, raisins & turkey jus, Filet Mignon Wellington with mushrooms, glazed carrot and veal jus, Pan Seared Ray Wings with mushroom trumpet crust, barley and sweet pumpkin juice, Sea Salt Crusted Lavraki with orange & rosemary, Grilled Lamb Chops and Gnocchi with Parmesan cream, artichoke and arugula sauce. Pick two sides from options like Mashed Potato with chestnut, Roasted Sweet Potato with onions & rosemary, Roasted Brussels Sprouts and more. Last but not least, choose a mouth watering dessert that include options like Homemade Apple Pie, Pumpkin Pie or Baklava served with vanilla gelato .Call 212-221-0144 to book your table and visit kellariny.com for more information. Celebrate Thanksgiving at Haven Rooftop (132 W 47th St) above The Sanctuary Hotel. Enjoy dinner with your family and friends surrounded by breathtaking views of Manhattan at $65 per person for a 3-course meal. Featured dishes include Butternut squash soup and Polenta lasagna as an appetizer, Turkey or Truffle gnocchi as your entree, and Pumpkin cheesecake, Dulce de leche rice pudding, or Chocolate mousse to top off the exemplary Thanksgiving meal. Celebrate Thanksgiving at Nerai (55 E 54th St.) with a delicious three-course meal priced at $65 per person. Let Nerai entertain and satiate your guests with their Prix Fixe menu that offers a Greek twist on classic Thanksgiving dishes including Kabocha Squash Soup, Turkey Moussaka, and Pumpkin Cheesecake. Their a la carte menu will be offered featuring Greek dishes like char-grilled octopus over Santorini fava, baby lamb chops with onion soubice, a dolma and oregano jus, and hand rolled baklava with pistachio gelato for dessert. Dinner reservations can be made by calling (212) 759-5554 or by visiting: https://nerainyc.com/menus/thanksgiving-2018/. Bagatelle (1 Little West 12th Street) is offering a to-go menu that feeds up to 8 hungry people for $375 (that's under $50 p/p!). This mouth-watering menu includes a huge 16-20 lb organic roasted turkey, traditional thanksgiving stuffing (pork or vegetarian), garlic mashed potato, sweet potato soufflé, green beans with sautéed onions and toasted almonds, caramelized Brussel sprouts, butternut squash fricassee, turkey gravy, citrus cranberry sauce and a traditional pumpkin pie. Reserve your meal now and pick up is on 11/21 from 10am to 11pm or 11/22 from 8:30am to 12pm. To order please email events@bistrotbagatelle.com or call 212-924-2959 Ext 1. Oceana (120 W 49th St.) prides itself on serving seasonal products and high quality seafood. It is conveniently located by Radio City Music Hall and the theaters of Broadway. Their executive chef is Bill Telepan. This Thanksgiving, Oceana will be open from 12pm to 9pm. They will be having a three course meal, which will include a gift that can be used on the next visit to Oceana. Ousia (629 W 57th St.) is all about Greek and Mediterranean cuisine. Ousia can be found in Manhattan's west side, and also uses ingredients which are locally sourced. Their executive chef is Carlos Carreto, and their chef de cuisine is Vasiliki Vourliotaki. This Thanksgiving, Ousia will be open from 1pm to 8pm. They will be having a four course meal which includes two different meal options per course. The Breslin (6 W 29th St) focuses on serving American cuisines, and bar food late at night with famed chef April Bloomfield. This Thanksgiving, The Breslin will be open from 12pm to 9:45 pm. They will be having a four course meal with a set first and second course, but you have two options for the third and fourth course. 10 Corso Como Restaurant & Cafe (1 Fulton St.) is all about serving Italian food. They can be found at 200 Front Street in New York City. Their chefs are Jordan Frosolone and Danilo Galati. This Thanksgiving, 10 Corso Como Restaurant & Cafe will be open for brunch from 10am to 3pm. For dinner they will be open from 4pm to 8pm. They will be having a four course meal that combines the northern Italian cuisine the restaurant is known for with more modern preparations and traditions. The Loyal (289 Bleeker) with their executive chef is their owner John Fraser will be open this Thanksgiving, The Loyal will be open from 11:30am to 9pm. They will be having a three course meal with multiple options to choose from spiced bird broth, popovers with butter + jam, gnocchi with shiitake, pumpkin + warm spices, fluke crudo, braised beef shortrib, turkey breast, and cornbread stuffing. Supplements include pappardelle with truffles + a 24 oz prime ribeye. Irvington (201 Park Ave. South) serves new American dishes with a Mediterranean influence in the heart of Union Square. This Thanksgiving, Irvington will be serving sweet potato soup, turkey, acorn squash lasagnette, and pumpkin cheesecake mousse. The Ribbon (20 W 72nd st.) is a newer restaurant that opened last month in The New York Times Annex. Their food ranges from seafood to steak. This Thanksgiving, The Ribbon will be serving seared arctic char, butternut squash, pecan pie, and more.